The new home of Waters Crest looks quite homey. What a difference a year makes! Last fall we visited Waters Crest’s tiny tasting room in a drab strip of shops around the corner from the Southold town dump and had the room to ourselves; this fall we encountered a limo full of 20-somethings on their way into a cozy cottage on the Main Road that had been transformed into a comfortable bar and groupings of tables and chairs. Over near the windows, a group was celebrating one person’s birthday, cake and all. Next to us at the bar we got into a conversation with two men who turned out to also be bloggers and a very friendly young woman who owns a nearby bed and breakfast (the Sunny Side Up Bed and Breakfast, closed now for the season, but check them out next June), who is also quite knowledgeable about local wine and food. There were several sets of comfy chairs. 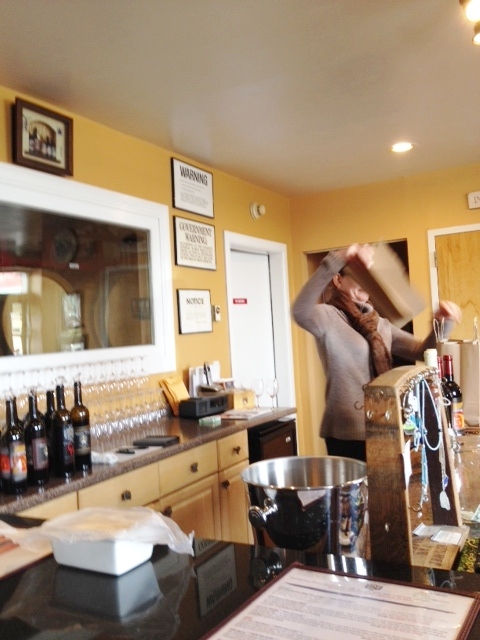 The advantage of being the only ones in the tasting room last year was that we had the exclusive attention of Adam, the very well-informed server who gave us all sorts of information about the wines. This time, we again encountered Adam, and had occasion to admire his ability to multi-task as he handled the crowd (with the help of Mrs. Waters and her daughter), and, after things calmed down a bit, again talked with us seriously about the wines, about which he is clearly passionate. And he has much to be proud about, as we liked all the wines, some more than others. 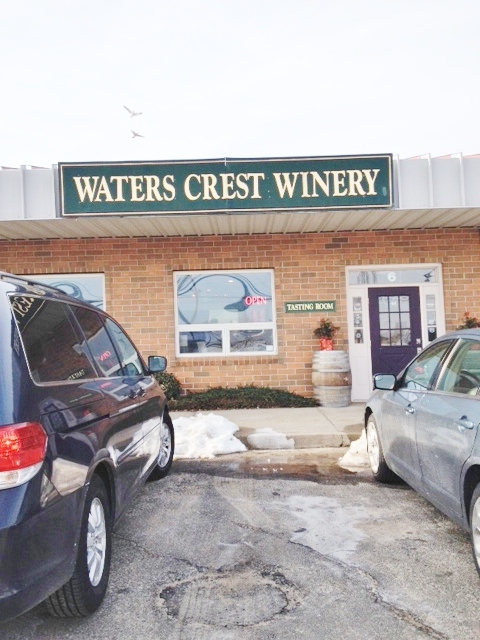 Jim Waters doesn’t have his own vineyard, but produces his wines from grapes he buys from various growers, such as Jamesport. Clearly, he chooses well. The tasting menu offers eight different wines—four whites and four reds—all of which you can sample for $20, a bargain. Or you can pick only a few, at $4 per taste. Since I have a cold, and we wanted to try all eight, we decided the way to share a tasting was to get two glasses and have my husband pour half the taste into my glass. Once Adam realized what we were doing, he very courteously shared out each tasting between the two glasses, and we certainly had plenty to drink. According to the menu, the rosé is made from a blend of merlot, cabernet sauvignon and sauvignon blanc using the “saignée” method, in which the juice is taken from red grapes at an early stage, when it is still light in color, and can then be mixed with white grape juice. We note a faint aroma of unripe strawberries and then sip. If I was blindfolded, opines my tasting pal, I would think this was a sauvignon blanc. I see what he means, because this is quite dry with a bit of a citrus edge, but also some strawberry flavor like a rosé. It would certainly pair well with oysters. This is just the type of riesling we like—dry, crisp, and mineral. I think it smells like honey, and my husband adds leather. The taste reminds me of a nice crisp pear, and I think it would be perfect with lobster bisque. If you are ambivalent about whether you like your chards oaked or unoaked you might like this one. The wine is fermented in steel, then spends three months in used French oak, so it gets just a hint of the vanilla the oak imparts. This particular wine is already sold out (except for what they keep for the tasting room) and I can see why. The little bit of oak smooths out the edges of the wine, which is dry with green apple tastes and some minerality and really nice acidity. Lemongrass “on the nose,” as they say. Not drunk, just trying a different angle! Adam explains that this is actually an orange wine, which means that though it is a white it has a faint orange tone from the grape skins. If you’re expecting an Australian-style sauvignon blanc you’ll be disappointed, but if you come with an open mind you’ll probably be happy. It has a bit of a butterscotch taste and aroma, and would complement a plate of charcuterie beautifully. As we transition to the reds, Adam rinses both our glasses with a bit of the red, a good idea. 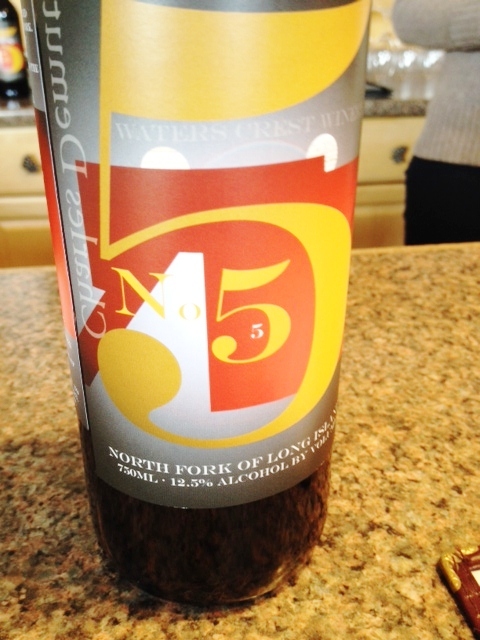 This bottle has my favorite label, a version of the famous Charles Demuth painting of the “Great Number Five” which was inspired by a poem by William Carlos Williams (check out the painting for “secret” clues to their friendship). It is almost all merlot, with 11% cabernet sauvignon and 4% malbec. We enjoy it, but my husband adds, “This wine lacks gravitas.” Yes, it is a rather light red, with some aromas and tastes of plum jam. Good for casual drinking, maybe with roast chicken. 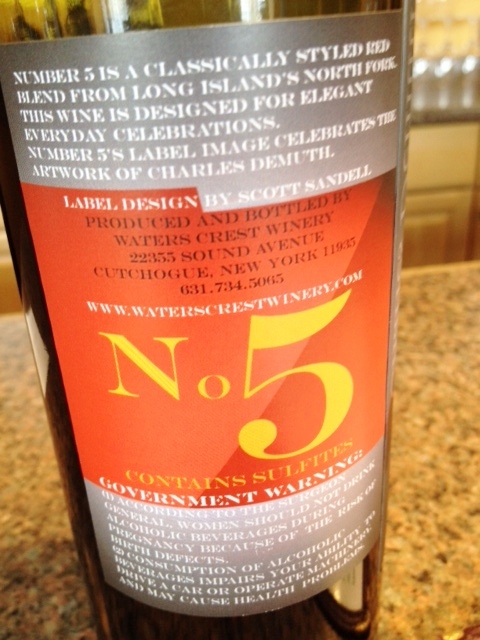 This is one of a number of Waters Crest’s wines with high ratings from Wine Enthusiast. Personally, as a retired teacher, I am not into assigning grades, but if you find that helpful, there it is. Adam suggests that this wine, though it has been aged 22 months in new French oak, would benefit from further aging. There are plenty of tannins, so I think he had a point. Both the aroma and the taste have notes of spice, and if you drank it now I would pair it with lamb chops. I recommend you check out the meats from Eight Hands Farm—all pasture raised and quite delicious. We liked the ceiling lights, like mini-barrels. You could age this one for ten years, suggests Adam, but if you bought it you probably would drink it sooner than that. It is quite delicious, and our new friend-with-the-bed-and-breakfast’s favorite of the wines. After aging 22 months in new French oak, it has lots of dark fruit tastes, plenty of tannins, plus notes of chocolate, leather, raspberries, and spices. It could stand up to a steak, maybe from Wayside Market. We discuss the season of 2013, which was a long hot one, leading to lots of ripeness in the reds. This one smells to me like chocolate bark with almonds and berries, and the taste is more blackberry than chocolate. Though Adam says again this could be aged 15 or more years, we find it quite smooth, almost velvety. This one spent 23 months in American oak before being bottled. One part of the bar area. Reasons to visit: pleasant new tasting room conveniently located across the street from Wickham’s Fruit Farm stand and Touch of Venice (where, if you bring a bottle of Waters Crest wine, they waive the corkage fee);they have a roomy parking lot in the back; the Dry Riesling, Reserve Chard, and Sauvignon Blanc among the whites; the Merlot, Cabernet Franc and Cabernet Sauvignon “Grand Vins”; Adam if he’s serving in the tasting room; the pleasant back yard (in the warmer weather). 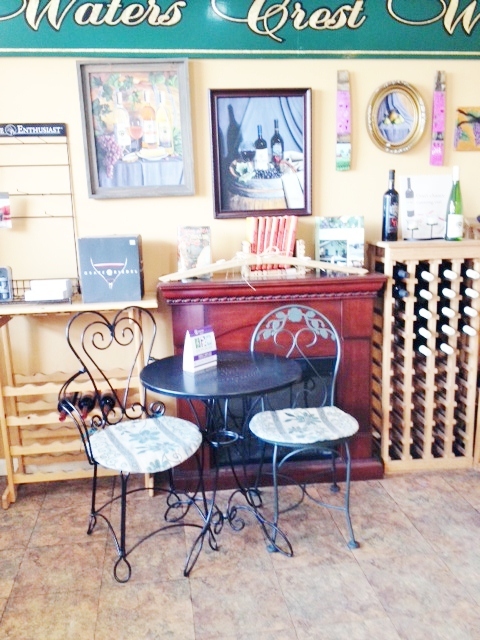 We might have to come back on a Friday and get a glass of cabernet. Or in the summer, to experience the back yard.